One of the great advances in the field of cancer therapy in recent years is the emergence of immune therapies. Immune therapies, especially immune checkpoint inhibitors, have shown promising results in pre-clinical models and clinical trials of solid tumors, such as melanoma, breast cancer and lung cancer. Therapeutic strategies targeting the immune microenvironment have also been applied to hematological malignancies such as multiple myeloma (MM), a plasma cell neoplasia characterized by clonal proliferation of malignant plasma cells mainly in the bone marrow (BM). MM is associated with both cellular and humoral immune deficiencies, indicating that the evolution of the disease from a precursor state (monoclonal gammopathy of undetermined significance (MGUS) and smoldering MM (sMM)) is associated with an immunosuppressive milieu that fosters immune escape and tumor growth. Despite significant advances in treatment, MM is mostly an incurable disease. Therefore, it is vital to develop novel therapeutic agents that not only target the MM clone itself but also the MM immune microenvironment. However, the complexity of the BM microenvironment and heterogeneity of tumor cell clones make it a difficult task for developing appropriate immune therapies of MM. In this article, we review the current knowledge of the interaction between malignant plasma cells and the bone marrow immune microenvironment during disease progression. Keywords: Multiple myeloma, tregs, MDSCs, effector T cells, NK cells, DCs, macrophages checkpoint inhibitors. Keywords:Multiple myeloma, tregs, MDSCs, effector T cells, NK cells, DCs, macrophages checkpoint inhibitors. Abstract:One of the great advances in the field of cancer therapy in recent years is the emergence of immune therapies. Immune therapies, especially immune checkpoint inhibitors, have shown promising results in pre-clinical models and clinical trials of solid tumors, such as melanoma, breast cancer and lung cancer. Therapeutic strategies targeting the immune microenvironment have also been applied to hematological malignancies such as multiple myeloma (MM), a plasma cell neoplasia characterized by clonal proliferation of malignant plasma cells mainly in the bone marrow (BM). MM is associated with both cellular and humoral immune deficiencies, indicating that the evolution of the disease from a precursor state (monoclonal gammopathy of undetermined significance (MGUS) and smoldering MM (sMM)) is associated with an immunosuppressive milieu that fosters immune escape and tumor growth. Despite significant advances in treatment, MM is mostly an incurable disease. Therefore, it is vital to develop novel therapeutic agents that not only target the MM clone itself but also the MM immune microenvironment. However, the complexity of the BM microenvironment and heterogeneity of tumor cell clones make it a difficult task for developing appropriate immune therapies of MM. 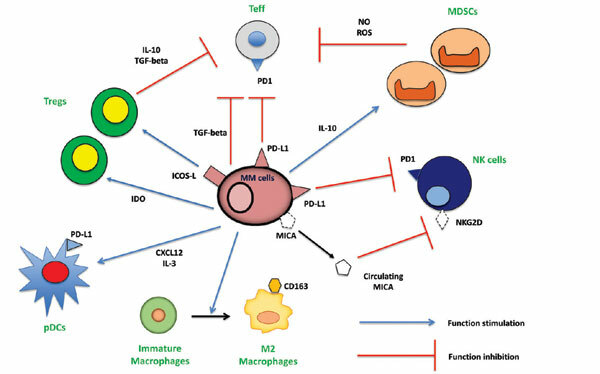 In this article, we review the current knowledge of the interaction between malignant plasma cells and the bone marrow immune microenvironment during disease progression.